A little bit about not a lot A Little Bit About Not A Lot: Another lesson learned - This time its walking boots! Another lesson learned - This time its walking boots! The (very) few people reading this blog may recall my excitement (and nervousness) in previous posts, in relation to a new pair of Brasher walking boots. Prior to the Black Mountains wild camp, I'd walked under ten miles on easy terrain but things felt good inside those boots. This was until the Gods turned on me, of course, and decided to teach me a valuable lesson about buying and wearing walking boots! As I had commented on in the not-so-live posts during the trip, the Brasher's had began giving me blisters in the backs of my feet within hours setting off. My problems started only when we began on the ascents but the damage was done and the stage was set for a painful 2 days of walking. My lack of experience with walking boots meant that my feet (despite my futile attempts at clamping them in) were slipping out of the heel area of the boot. I added socks, I took them away, I packed a sock under the heel end of the foot bed but nothing I could do on the hill would stop the slipping. I did what I could to try and alleviate the pain but I just didn't enjoy the walking on this trip at all. I didn't entirely just get of my sofa and head out to get some boots. The Buttermere trip had revealed that my (still respected) Hi-tech V-lites weren't up to the mountain terrain and load bearing I had put them through. It was time to look for some new boots. I read a bit and Paul shared some knowledge but as always I wanted to do this on a budget. 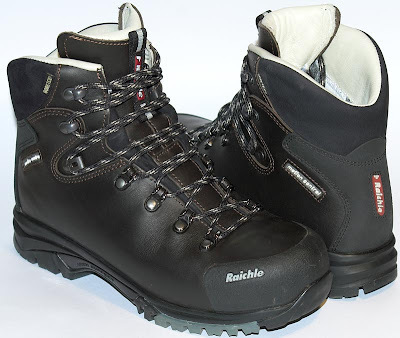 I had set myself a budget and for that I needed a leather walking boot that would be waterproof, breathable and suitable for a wide variety of terrain. My budget needless to say was £60 - What? A lighter pack and tent were high on the list at the time! Most things I came across on the net pointed out the importance of trying a variety of brands and boots before settling on the right pair. I didn't really take any notice of this and just assumed I could rock on up at my local outdoorsy shop, pick a style I liked the look of in my size and price range, bound around the store in them for a few seconds (doing that thing where you walk lop-sided trying to check out how you look from the side) before buying them and not looking back for the next 10 years. Oh how the Gods must have laughed as they planned my post purchase dissonance. In fairness to me (and I do like to fair) I had the full intention of sitting with a sales assistant and listening to their advice but I'd chosen the wrong day as it was rammed and the glee at buying something new got the better of me! Subsequently the sales folk pointed me in the right direction and left me to it. I have now come to realise that the purchase of walking boots comes down to a number of variables including your budget, the brands available to you and your feet. On Sunday I plucked up the courage and went back to the shop where I bought the Trailmasters weeks before. They had no smaller sizes in stock and having tried a plethora of volume adjusters, foot beds, additional socks and even lacing techniques, they concluded the Brashers weren't suitable in this instance. They honoured the 'comfort guarantee' and I proceeded to try an eternity of boots from 5 different brands. After nearly two hours of walking boot mayhem, we found that my feet varied in sizes across manufacturers, I suited a narrower boot, and particularly one which had a well defined heel profile. The issue each time was heel slippage (mainly in my smaller right foot) and I finally settled on the a boot that seems to fit this criteria. The Raichle MT Trail XT GTX - below. I appreciate your humor and good will. Keep it coming! Have you ever read Ray Jardine's book "Beyond Backpacking"? Hey again Blabberon, Hope you are well. I checked your blog last week and was glad to see you had posted a brief piece about your two week trip in the High Sierras. Just a thought but I (and your subscribers) would read with interest about your planning and preparations. As regards Beyond Backpacking, I haven't read it but have heard a lot about it from my travels through cyberlife! I would suggest though that the notion conveyed by Ray is easily applied to walking boots - ones enjoyment of hiking is infinitely proportionate to the comfort of your boot! Look forward to hearing more about your activities on the run up to your trip this fall. I've never tried the insole approach, then again I've never tried walking in completely new boots that didn't fit! I think these would be useful for carrying heavy loads though to ease the impact on the troublesome areas of the feet. Your blog is really informative, keep it up. I bought some brasher boots from Cotswolds in reading, the shoes were bad but the cotwold fitting service was terrible. they didnt care about what i would be doing or the type of feet i had. After my blister fest i went to an independant shop called altimus, they were great. I reckon they must have he best boot fitting service in berkshire. I read an article in Trail magazine last month on their investigation in boot fitting services in the major players. Some of these were independents and others chains. The issue for most who scored badly was training of fitting staff. I'm finding more and more that with certain items of outdoors gear to head straight for an independent. I'm glad you have your boot issues sorted and I pray mine are too!